赵捷杰, 陈四清, 徐大凤, 常青, 张鹏飞. 短蛸的早期生长特征[J]. 渔业科学进展, 2019, 40(2): 98-105. DOI: 10.19663/j.issn2095-9869.20180319001. ZHAO Jiejie, CHEN Siqing, XU Dafeng, CHANG Qing, ZHANG Pengfei. 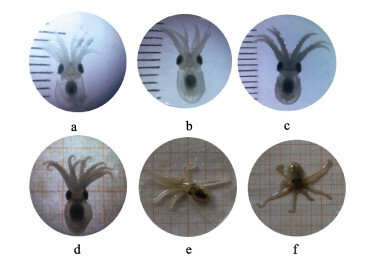 Early Growth Characteristics of Post-Hatching Octopus ocellatus (Mollusca: Cephalopoda)[J]. Progress in Fishery Sciences, 2019, 40(2): 98-105. 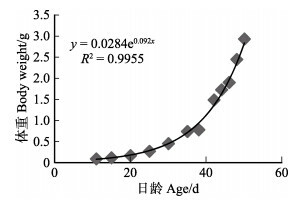 DOI: 10.19663/j.issn2095-9869.20180319001. Corresponding author: CHANG Qing, E-mail:changqing@ysfri.ac.cn. Abstract: The early growth characteristics of Octopus ocellatus larvae raised under culture conditions were analyzed. 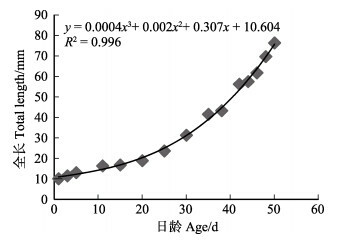 Ten larvae were sampled at different periods from post-hatching to when larvae were 50-days-old, and their body weight, total length, arm length, and mantle length were measured. We described the growth characteristics of O. ocellatus, to define the different phases characterizing this species' post-hatching development. 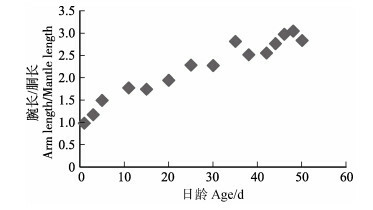 The larval stages of O. ocellatus were divided into a planktonic stage and a benthic stage, with benthic life beginning at the age of 11 d. At water temperatures of 22℃~24℃, the cultured larvae could grow from an average total length of 10.03 mm on the first day post-hatching to a benthic octopus with an average length of 16.21 mm by the 11th day post-hatching. 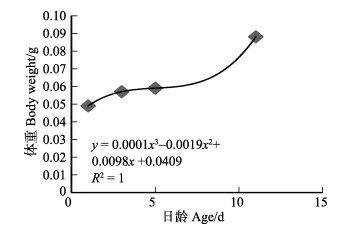 The results showed that the body weight of planktonic O. ocellatus increased with time according to a cubic function, the equation of which was: y = 0.0001x3 – 0.0019x2 + 0.0098x + 0.0409. 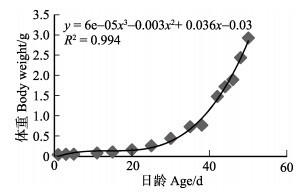 On the other hand, benthic O. ocellatus body weight increased according to an exponential function, the equation of which was: y = 0.0284e0.092x. 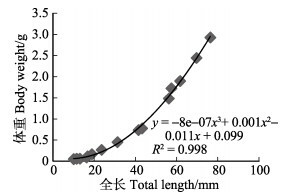 The total length of O. ocellatus larvae exhibited a cubic relationship with body weight, the equation of which was: y = –8e–07x3 + 0.001x2 – 0.011x + 0.099. 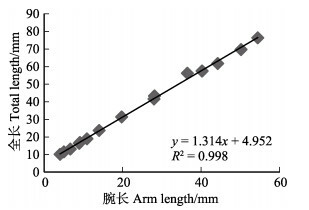 Total length was linearly related with arm length, as represented by the equation: y = 1.314x + 4.952. Body weight, total length, and arm length exhibited cubic growth functions over time, as represented by the equations: y = 6e–05x3 – 0.003x2 + 0.036x – 0.03, y = 0.0004x3 + 0.002x2 + 0.307x + 10.604, and y = 0.0004x3 – 0.007x2 + 0.364x + 4.205, respectively. The larval body is transparent, and the visceral mass of the larva is a golden color during the first day post-hatching. As the individual grows, the color deepens to a yellowish brown. 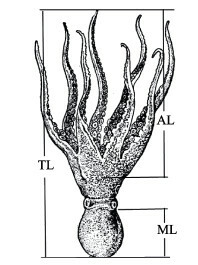 Newly hatched O. ocellatus usually have 14 to 16 suckers, and with the constant growth of the larval wrist the number of wrist suckers gradually increases. The new suckers appear at the end of the wrist, each beginning as a small, raised bulge that then increases in size until a new sucker is formed.